So Where is Japan’s Radiation Going? Japan’s nuclear agency reported to the IAEA today that the nuclear fuel in three reactors at the Fukushima I Nuclear Power Plant likely melted through the inner containment vessels and not just their cores in the aftermath of the March 11th earthquake and tsunami. As MoJo’s Kate Sheppard reported earlier today, Japan also more than doubled the estimate of the amount of radioactive materials released from Fukushima—from 370,000 to 770,000 terabecquerels. Which makes the work of a research cruise just now underway to measure radioactivity in the ocean off Japan even more important. This 15-day cruise is led by chief scientist Ken Buesseler of the Woods Hole Oceanographic Institution (WHOI) and members of his lab, Café Thorium. They’re joined by researchers and technicians from around the world. 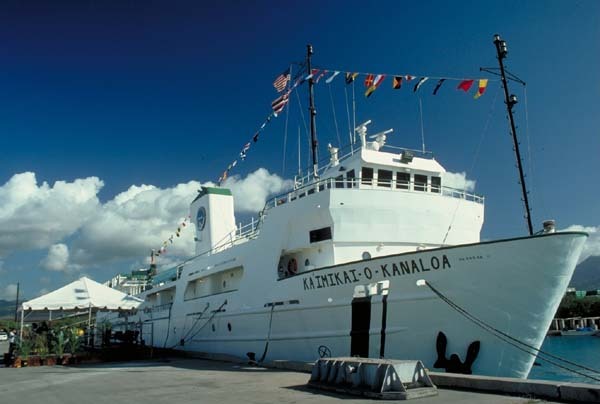 The science crew of 17 is sailing aboard the research vessel Ka`imikai-o-Kanaloa—the Hawaiian name means Heavenly Searcher of the Sea—a vessel of the Hawaii Undersea Research Laboratory. You can check out some of their onboard toolkit here. 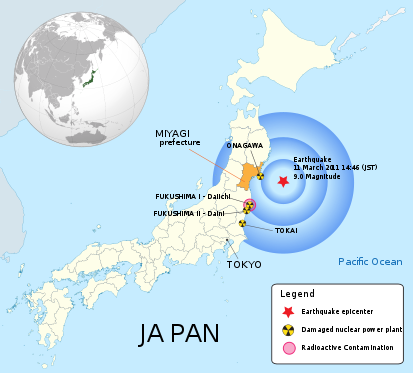 Japan’s damaged nuclear power plants in relation to the T?hoku earthquake and tsunami. Credit: Maximilian Dörrbecker / Chumwa via Wikimedia Commons. The failures of engineering at Fukushima, combined with Japan’s spectacular disaster unpreparedeness, resulted in the largest ever accidental release of radiation to the environment. Much of that contamination washed into the Pacific. Additional airborne radioactivity likely further contaminated the ocean. The need to understand the amount, type, and fate of radioactive materials released prompted a group of scientists from the U.S., Japan, and Europe to organize the first multi-disciplinary, multi-institutional research cruise in the northwestern Pacific since the events of March and April. [We’ll] spend two weeks… examining many of the physical, chemical, and biological characteristics of the ocean that either determine the fate of radioactivity in the water or that are potentially affected by radiation in the marine environment. They’ll be sampling well out into the mighty Kuroshio Current, a rich highway for the marine life of the North Pacific. The isotopes/elements they’re looking for are: iodine-131, cesium-137, plutonium, strontium, and tritium. For a map of their sampling stations, see my blog Deep Blue Home. 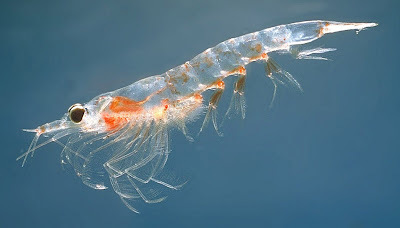 Krill. Credit:Øystein Paulsen via Wikimedia Commons. Because 3 months have passed and most isotopes, particularly the short-lived iodine-131 with an 8-day half-life, have decayed considerably, he doesn’t expect to see any toxicity. However, there will still be detectable levels in organisms such as brown seaweed, which can store iodine at 10,000 times the concentration in the water. Such a measure might help researchers understand how the isotopes move through the food chain, even up to seafood-eating humans. Meanwhile Geoff Brumfiel & David Cyranoski at Nature News provide a great roundup of the ongoing challenges at Fukushima, including the ongoing grave reservations held by some researchers about the methods used. [S]ome experts in Japan have expressed reservations about the decontamination process. Radioactive water will continue to flow from the cores into basements and trenches, and damage to the site means there will probably be further leaks. Ming Zhang, who studies environmental pollution risks at the National Institute of Advanced Industrial Science and Technology in Tsukuba, fears that contaminated water will end up in the ocean. From the sounds of things, the Ka`imikai-o-Kanaloa has just made it to the first sampling stations. You can read bloglike updates from the cruise here. Crossposted from Deep Blue Home.